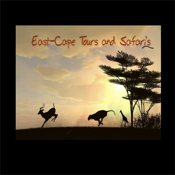 This East Cape Tours app will allow you to choose your ideal African holiday by providing you with up to-date information on the most popular destinations. •an African Safari - ranging from a modest lodge in the Kruger National Park to Sir Richard Branson's five star Ulisaba Lodge. The Big Five are within your fingertips to view at any one of these resorts. •an Adventure tour - for the more adventurous, start the day with a splendid balloon ride, dive with the sharks, take the Worlds highest bungee jump, go caving and or white water rafting,tour the tree tops in our natural forests along the Garden Route, go whale watching or diving with the dolphins, and end the day with a gourmet meal in the Winelands. •a honeymoon never to be forgotten in the splendid settings at Fancourt golf estate, in the Cape Winelands, Kruger National Park or even close by in Madagascar, Mozambique or romantic Zanzibar. •to take a self drive tour around the picturesque Garden Route or Kruger National Park or take the flower viewing package on the West Coast or simply go off the beaten track. •an exotic African package either in Botswana, Zimbabwe and the spectacular Victoria Falls, stroll the Mozambique beaches, visit Zanzibar, Tanzania, Namibia or simply take the Worlds most luxurious train journey for a few days. Download the app in order to find out more about what is on offer in the holiday and image tabs and allow yourself to dream up a perfect holiday allowing us to worry about the logistics. Use the currency convertor, check out the weather and local travel tips fro within the app. During your trip make notes, submit photos and connect with your friends on your social media Facebook and email links. The app is compatible with iPhone, IPod touch, IPad and all Android devices. We are a member of SATSA (South African Touring Services Association) and have been since 2001. This binds us to a strict code of ethics, and confirms we have complied with stringent legal and insurance requirements. Booking with a SATSA member ensures that your trip to South Africa is guaranteed to be of the highest standard.